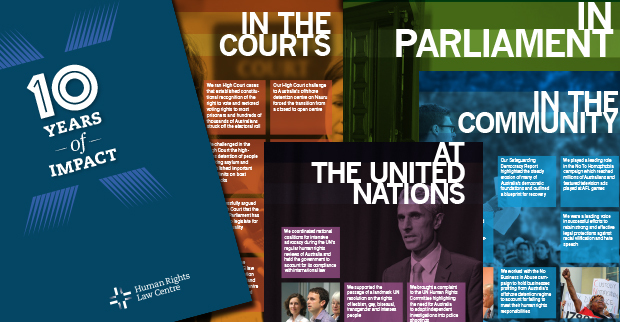 After 10 years of impact working as a national human rights organisation out of Melbourne, the Human Rights Law Centre has opened a Sydney office. Emily Howie, our Director of Advocacy and Research, will be continuing her great work out of Sydney, sharing office space with our friends at the Public Interest Advocacy Centre and Justice Connect, for an initial 12 month pilot. Thanks to the generous pro bono support of Ashurst, she’ll be joined by a secondee lawyer from early December. The HRLC works at the state, territory, national and international level for an Australia where human rights are universally understood, upheld and enforced. Being in Sydney will strengthen our work and deepen our partnerships with NSW-based organisations to advance shared human rights goals. We also look forward to strengthening our NSW-specific work, including on LGBTI rights, democratic freedoms and abortion law reform. This next step for the HRLC after 10 incredible years is an important opportunity to lend our voice to Sydney’s passionate human rights advocacy. For those in Sydney, we look forward to working more closely with you.